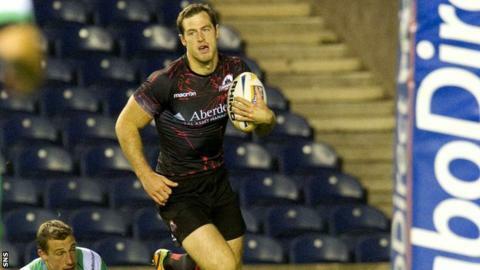 Edinburgh slumped to defeat by second-bottom Treviso in a stop-start encounter at Murrayfield. Two tries from Robert Barbieri added to a penalty try put the physical Italians in the driving seat. Tries from Tim Visser and Lee Jones clawed back some of a Treviso lead built on the backs of a dominating pack. And a late Dougie Fife try salvaged a bonus point, but it was too late to find the points to win. Edinburgh started well but lost their way and endured a torrid first half in which the Treviso forwards exerted strong pressure on the home pack. That pressure resulted in a 29th minute penalty try to the visitors which cancelled out captain Greig Laidlaw's earlier penalty. Edinburgh replied inevitably through winger Tim Visser who streaked in from 60m after being released by a David Denton pass. But Edinburgh's first-half misery was compounded by a late Barbieri try. Di Bernardo converted an early second-half penalty to put Treviso 10 points clear of Michael Bradley's side. Barbieri pounced again to score after Treviso charged down a lineout with Edinburgh all at sea and the Italian forwards dominating. A superb individual try by Scotland international Jones gave Edinburgh some hope, with Fife's late touchdown giving Bradley's side a sniff of an unlikely victory. A late Visser break had the home crowd out of their seats, but the Dutch-born Scotland cap kicked the ball too far ahead and the chance to claim more than a losing bonus point was gone. Edinburgh: Tonks, Jones, Scott, Atiga, T. Visser, Laidlaw, Leck, Jacobsen, Ford, Nel, Gilchrist, Cox, Denton, Grant, Basilaia. Replacements: Fife for Tonks (41), Rees for Leck (55), Yapp for Jacobsen (55), Titterrell for Ford (73), Rennie for Denton (59), Talei for Grant (59). Not Used: Niven, Houston. Treviso: McLean, Iannone, Benvenuti, Sgarbi, Botes, Di Bernardo, Semenzato, Rizzo, Ghiraldini, Cittadini, Pavanello, Minto, Favaro, Zanni, Barbieri. Replacements: Filippucci for Semenzato (75), De Marchi for Rizzo (48), Di Santo for Cittadini (75). Not Used: Ceccato, Bernabo, Budd, Burton, Toniolatti.